THE SACRED MEANING OF CHINA’S ALTAR OF HEAVEN is often a fascinating documentary asking and answering what is the oldest religion in China. Although large portions of this documentary are like an illustrated lecture, it is highly commended for anyone interested in China, especially the faith and values of the Chinese people, which were originally monotheistic. THE SACRED MEANING OF CHINA’S ALTAR OF HEAVEN is often a fascinating documentary asking and answering what is the oldest religion in China. This quest to answer this mystery presents not only a lot of information but is very intriguing. However, as the documentary progresses, it moves more and more into the explanation of Judaism and Christianity, which becomes way too didactic at times. The Altar of Heaven is a complex of religious buildings located in southeastern Beijing. The documentary starts by telling the viewer that, at the time of its production, there were 1.4 billion people in China, which is the fourth largest country in terms of land mass. Then, there are men and women on the street interviews asking what’s the oldest religion in China. Some say Buddhism, which appeared just a few short years before Jesus. Some say Taoism. Some say Lao-tzu. Some say Confucianism. The movie’s insights into these religions is fascinating. In 500 B.C., Confucius himself wrote five books on the early history of China and, in the earliest history, the religion was monotheistic, centering on the worship of the one true God, Shang-di (sometimes also written Shang-ti). Much of the attributes of Shang-di, as the all powerful and all knowing Creator, directly reflect the attributes of God in the Book of Genesis. In fact, early China also had the flood story. Then, the documentary talks about the flood stories, Babylon and the dispersal of people. These connections between the early history of China and Genesis are quite fascinating. The filmmaker then uses this Chinese history and the parallels to Judaism to develop a case for Christ. Although large portions of this documentary are like an illustrated lecture, it is highly commended for anyone interested in China, especially the faith and values of the Chinese people. On a side note, this documentary on the earliest form of religion in CHINA echoes the research of other scholars, such as the anthropologist Wilhelm Schmidt, who have shown that monotheism is the earliest form of religion not only in China, but also among the most primitive of tribes around the world. Schmidt’s theories have never been successfully refuted, though some have tried. However, renowned anthropologist Sir Edward Evans-Pritchard noted in his classic work THEORIES OF PRIMITIVE RELIGION, first published in 1962, that anthropologists have found that monotheistic beliefs exist side-by-side with other religious beliefs in most primitive societies. This evidence, and the evidence presented in THE SACRED MEANING OF CHINA’S ALTAR OF HEAVEN, shows that the story of Adam and Eve, which contends that the first religion is indeed monotheistic, has some solid credibility when it comes to anthropology and the scientific, systematic, historical study of ancient religions. It also lends even more credibility to what Paul says about monotheism and paganism in Chapter One of the Book of Romans. (CCC, BBB) Very strong Christian, biblical worldview with discussion of Christianity versus other Chinese religions; and, nothing else objectionable. 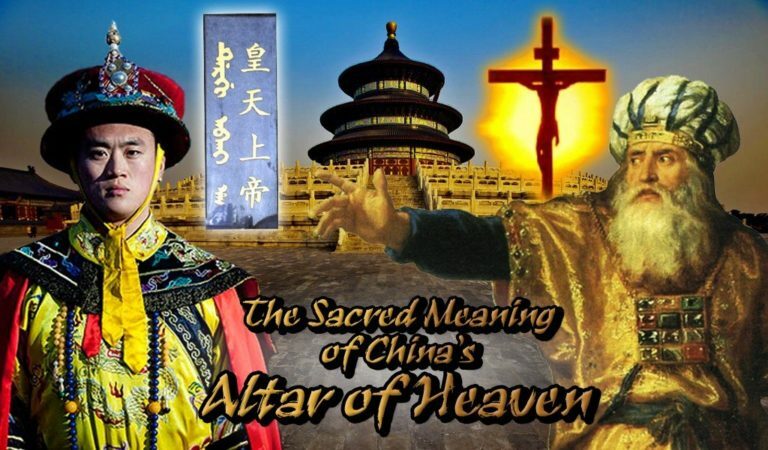 THE SACRED MEANING OF CHINA’S ALTAR OF HEAVEN is often a fascinating documentary discussing the oldest religion in China. The Altar of Heaven is a complex of religious buildings in southeastern Beijing. The documentary begins by telling viewers that, at the time of its production, there were 1.4 billion people in China. Then, it shows men and women on the street interviews asking what’s the oldest religion in China. The documentary discusses their answers, then shows convincing evidence that the first religion of the Chinese religion was monotheistic. THE SACRED MEANING OF CHINA’S ALTAR OF HEAVEN shows that the Chinese people’s earliest conception of God, whom the Chinese named Shang-di in their language, is of an all powerful and all knowing Creator. Their description directly reflects the attributes of God in the Book of Genesis. In fact, early China also had the flood story. These connections between the early history of China and Genesis are quite fascinating. Thus, despite some slow, didactic moments, THE SACRED MEANING OF CHINA’S ALTAR OF HEAVEN is highly commended for anyone interested in China and the Chinese people’s faith and values.